Kids who have ADHD rebel in the typical classroom environment. They believe it is second only to torture. Children with ADHD require a special kind of hands-on homeschooling that appeals to their rapid-fire brains. Homeschooling ADHD children is a challenge, but in the end, it’s a fun challenge. 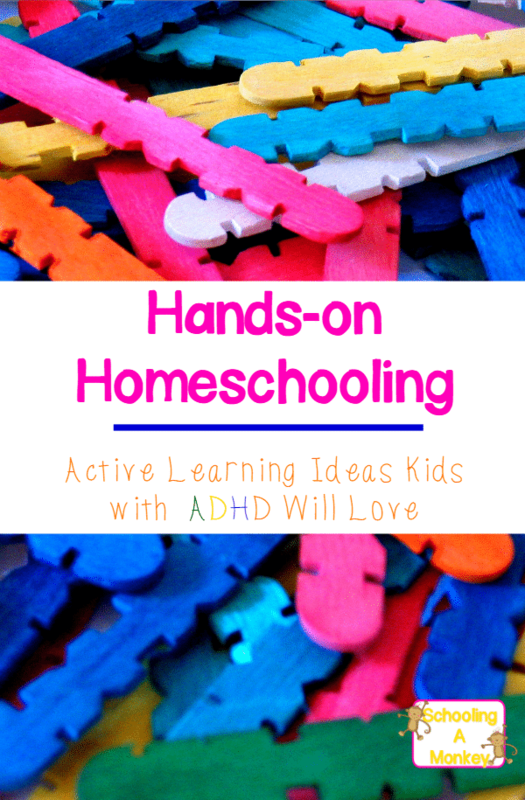 To help our ADHD daughter learn and remember what she learns, we offer hands-on homeschooling, including action-packed hands-on learning games, STEM activities for kids, and outdoor learning. 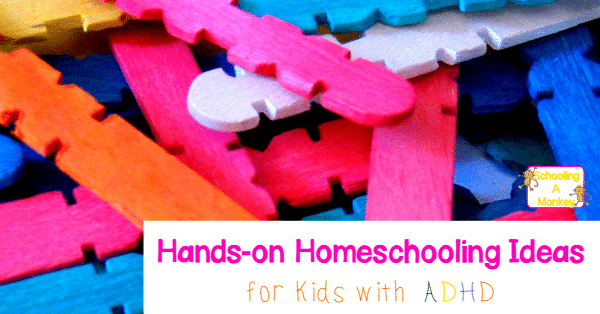 We’ve listed some of our favorite hands-on homeschooling ideas below. If your child has ADHD, they need to move. Facilitate their learning by providing hands-on learning tools that will challenge their brains and keep them engaged all day long. One of the seemingly strange symptoms of ADHD is hyper-focus. Hyper-focus seems like the opposite of ADHD, but it is a typical symptom. You can make this ability work for you in your homeschool by providing unit studies that align with a child’s interest. This is one reason why we have done so many STEM activities for kids– Monkey goes nuts for them and never gets tired of learning about science (although she struggles in the math part). We use unit studies to focus on subjects outside of math and language arts (although we love it when we can find ways to work that into our unit studies, too!). We’ve had a lot of fun with unit studies. All our past homeschool unit studies. While Monkey isn’t a fan of worksheets, she loves printables that involve hands-on learning, like printable games, printables that use manipulatives, or printables that encourage active thinking. Some of my favorite bloggers create amazing active printables. You’ll also find the active printables we’ve made at the Schooling a Monkey shop. Find more active printables on my Printables for Kids Pinterest Board. There are a million ways to learn with games. 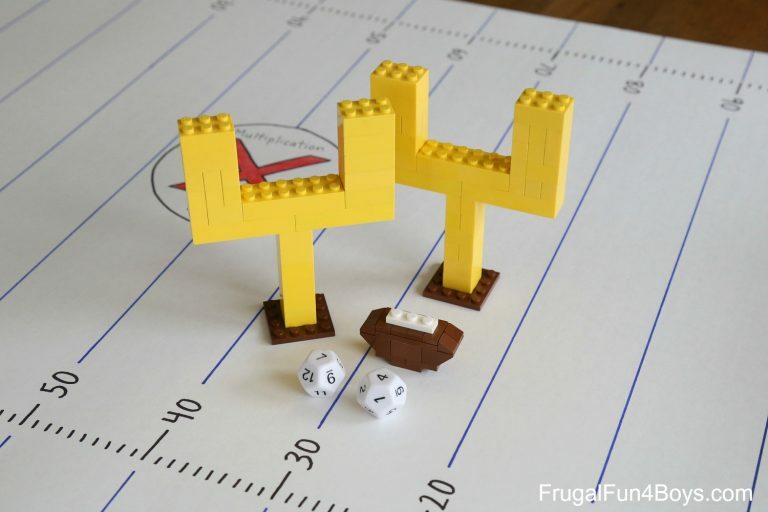 We’ve done our fair share of learning games, but when I need extra inspiration, I usually turn to the websites aimed at helping boys learn. My active girls love all of the ideas aimed at boys (and really, who wouldn’t?) and active learning ideas definitely appeal to the ADHD brain whether that brain belongs to a girl or boy. Something about learning a concept while moving around and having fun makes it stick for life! My kids go nuts for this kind of stuff. If I’m stumped for how to teach a topic, I know I’ll find something amazing here. Not all lessons can be taught in an active way, and some days you won’t have time for active learning. On those days, I just try to pick homeschool curriculum for ADHD that has short lessons. Short lessons are ideal for the fast-paced ADHD brain. Bonus points if the lessons look fun. However, too much on the page can also cause distractions. Monkey has spent 10 minutes of our lesson time trying to figure out what a child in the margins is doing because she needed to know *why* that girl was riding backward on a bike or why she wasn’t dressed appropriately for the weather. So, watch out for too busy pages as well. Short, colorful lessons without distracting images are best. 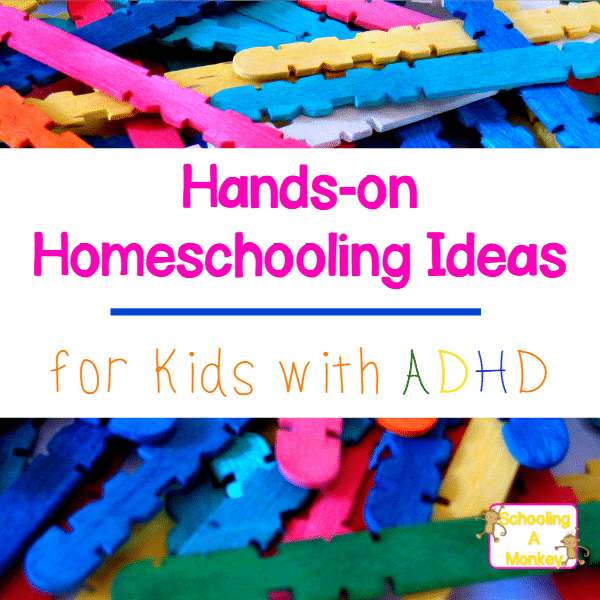 These hands-on homeschooling methods work for the ADHD brains in our house. If you have an ADHD child you’re homeschooling, share what works for you in the comments! Read the entire simple, no-nonsense guide to homeschooling ADHD here!